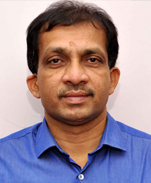 Sreenivasa Rao J is nutrition biochemist and micronutrient research specialist in the Division of Food Chemistry. He is the recipient of the prestigious Sagarmal Goyanka young scientist award for his best research performance (2010) from IDA and also received best research paper presentation award in nutrition research (2016) from International conference on mass spectroscopy, Chicago, USA. His expertise is in nutrition research, biochemistry and database analysis and he has been working extensively in the areas of micronutrient analysis, heavy metal toxicity, tribal malnutrition and food biodiversity especially those that are being consumed by the indigenous populations of the country and plant secondary metabolites. He has been constantly upgrading his skills related to health and nutrition research. Special focus is being put on non-nutrient bioactive substances and on the effects of different food processing methods on nutrient parameters. His research encompasses various aspects of public health nutrition including nutritional composition of indigenous foods, metal toxicity and malnutrition problems in population. He is a faculty member for regular and ad hoc training programmes being organized in the institute. He published several research papers in national and international journals, two book chapters and several papers in proceedings of national and international conferences. Sreeenivasa Rao J, Naveen Kumar B and Bhaskarachary K. Processing effect of diverse cooking methods on retention of β carotene all trans and cis isomers in green leafy vegetables-India. International journal of food and nutritional sciences. 2018. ISSN 2320 -7876. Vol. 7(2), 115-127. Sreenivasa Rao Jarapala. Nutrition Science in India: Green leafy vegetables: A potent food source to alleviate micronutrient deficiencies. International Research Journal of Basic and Applied Science. 2017; ISSN No. 2455-6718. Sreenivasa Rao Jarapala. Fish nutrition, potential health benefits and heavy metal research in India: Steps towards new horizon. International Research Journal of Biological Sciences. 2017; Issn. 2278-3202, Vol 6(6), 53-61. Sreenivasa Rao J and Longvah T. Proximate Composition and Determination of Heavy Metal Content in Indian Fish using ICP-MS after Closed Vessel Micro Wave Digestion. Food Science and Technology. 2016; 4(3): 42-48. Sreenivasa Rao J and Longvah T. A study on heavy metal content in Indian fresh water fish determined by ICP-MS after closed vessel micro wave digestion. International Journal of Food and Nutritional Science. 2015; Online published. Sreeenivasa Rao J and Bhaskarachary K. Retention based bio accessibility of carotenoids in green leafy vegetables: effect of different Indian culinary practices. Indian Journal of Community Health. 2014; 26: 270-278. Sreenivasa Rao J, Vasudeva Rao Y, Devindra S and Longvah T. Analysis of Heavy Metal Concentrations in Indian marine fish using ICP-MS after closed vessel micro wave digestion method. International Journal of Analytical and Bio analytical Chemistry. 2014; ISSN-2231-5012. Sreenivasa Rao J, Bhaskarachary K and Longvah T. Determination of Trace metal content using ICP-MS and closed vessel microwave digestion in Indian fresh water fish. Journal of Environment and public Health.2014;http://dx.doi.org/10.1155/2014/201506. Sreenivasa Rao J, Bhaskarachary K and Longvah T. ICP-MS determination of trace metal content in Indian marine fish consumed in Hyderabad. Journal of Advances in Fish Research. 2013; 4: 177-190. Devindra S, Sreenivasa Rao J, Bhaskar V and Mulimani V H. Effect of heat treatment on α-galactoside content of red gram seeds (Cajanus cajan. L). Journal of food processing and preservation. . 2012; 36: 97-103. Devindra Shekappa, Sreenivasa Rao Jarapala, Krishnaswamy Padmanabhan and Bhaskar Varanasi. Reduction of α-galactoside content in red gram (Cajanus cajan L.) upon germination followed by heat treatment. Journal of Science of Food and Agriculture. 2011; 91: 1829-1835. Manisha Ganeshan, Sainath P B, Padmavathi I J N, Venu Lagishetty, Kishore Y D, Kalle Anand Kumar, Harishanker Nemani, Sreenivasa Rao Jand Raghunath M. Maternal manganese restriction increases susceptibility to high fat diet induced dyslipidemia and altered adipose function in WNIN male rat offspring. Experimental Diabetes Research. Published online 2011, October doi: 10.1155/2011/486316. Bhaskarachary K, Sreenivasa Rao J and Longvah T. Effect of seasonal and diurnal variation in Carotenoid content of Green Leafy Vegetables. Indian Journal of Nutrition and Dietetics. 2011; 48: 522-528. Bhaskarachary K, Sreenivasa Rao J and Longvah T. Effect of Maturity on Carotenoid Content of some commonly consumed foods. Indian Journal of Nutrition and Dietetics. 2010; 47: 528-532. Sreenivasa Rao J. Millets-Current status in India, nutritional values and health benefits: Best Practices for Sorghum Cultivation and Importance of Value-addition, Chapter: 20, Publisher: Indian Institute of Millet Research-ICAR, Hyderabad. Editors: Rajendra R Chapke and Vilas A Tonapi. 2016; 179-186. Sreenivasa Rao J. Nutritional Values in Fish and Heavy metal research in India: Steps towards new horizon: Coastal and Marine Biodiversity: Prospects, Threats and Conservation Strategies, Publisher: Department of Marine Biology Vikrama Simhapuri University Nellore-Andhra Pradesh. Editor: Prof Vijaya Chalacherla. 2016. Sagarmal goyanka young scientist award: 2010 Indian Dietetic Association, national Conference, Hyderabad, India.